ADMIN NOTE: We’d like to welcome our newest writer to the JMR team! Before I start the review I have to say I’m a big fan of Menucha. When their first album came out I was listening to it over and over. 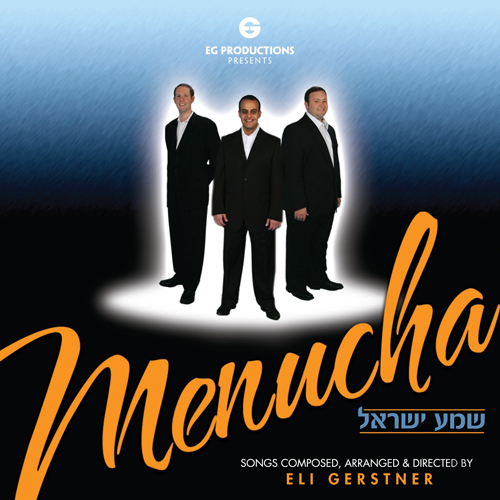 Though the Menucha songs were composed by Eli gerstner, I find the style very different than The Chevra. Menucha is like a calmer and toned down chevra which I like a lot. This album was supposed to come out over a year ago. I’ve been following the development since it was first talked about, and now after 6 years since the first one it’s finally out! And it sounds amazing! I give it 5 stars and encourage everyone to buy it. Now for the review, this is my first time writing an album review so bear with me. I’m going to go through the whole album in one shot instead of going through each song separately. The album starts off with a great intro by Avi Singolda which is one of the best Jewish guitar players out there (together with Ari Boiangiu and Piamenta) and has another one on track 8. Avi Avidani pulls off some double bass in the first song then keeps doing an incredible job the whole time. Yaron Gershovsky on piano is an Eli gerstner signature since no project is complete without him. String section is great with a YBC similar type intro on one song. Shlomo Schwed outdid himself with his extremely high voice which gives Menucha their unique sound. Avi Schachter & Danny Berkowitz have worked their way from the first album to sound even better (and they sounded great already back then). Auto-tune is brought in just the perfect parts and is not overdone. Great flute solo/intro on track 9. This is one of the first Jewish CDs where they feature other people on the songs which is a great idea and should be spread around. Track 3 features a solo by Yaakov Mordechai Gerstner and The Yeshiva Boys Choir. Track 4 features Dovid Stein who does a great solo. Track 7 features the great Eli Gerstner himself. I’m still waiting for a solo album by him since the last one was years ago (10?). Track 10 features Daniel Waldman, I don’t know if you remember him but he was the fourth person on the first Menucha album. After the album was released he branched off to make his own album called Bimakom Torah. All together there are 10 beautiful songs. Track 11 is just the first song unplugged. It would have been great if they would have made another Menucha song, but you can’t get everything. I still sing their song some Friday nights. Eli Gerstner has done another great job! And I really would like to see him make another solo album soon. I never knew that Daniel Waldman, who I pretty much just referred to until reading your review as “the fourth guy,” has an album of his own. That’s a good music trivia question. Thanks for that bit and very nice review. The singers however are very talented.. so congrats to them on a job well done.. i still feel that it doesnt even compare to Menucha 1.. that will never be surpassed.. and another tidbit.. having guest singers on albums have been done before.. go check it out! it’d most definitely not the first time.. does Vehu Keli ring a bell?